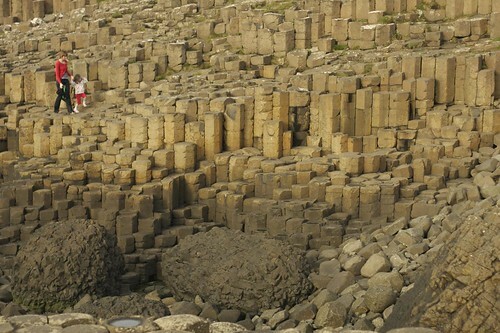 The Giant’s Causeway,en français, la Chaussée des Géants (traduit usuellement par un pluriel alors que ‘Giant’ est au singulier en anglais) is an area of about 40,000 interlocking basalt columns, the result of an ancient volcanic eruption. 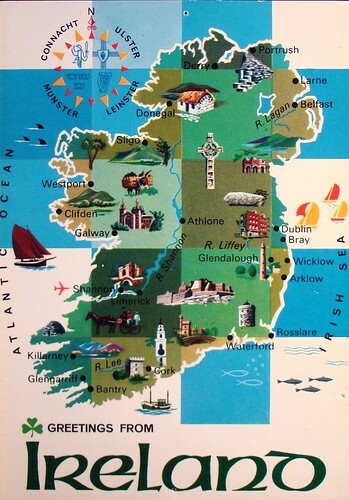 It is located in County Antrim, on the northeast coast of Northern Ireland, about two miles (3 km) north of the town of Bushmills (and Portrush on the above map). It was declared a World Heritage Site by UNESCO in 1986, and a National Nature Reserve in 1987. The tops of the columns form stepping stones that lead from the cliff (= la falaise) foot and disappear under the sea. Most of the columns are hexagonal, although there are also some with four, five, seven and eight sides. The tallest are about 12 metres (36 ft) high, and the solidified lava in the cliffs is 28 metres thick in places. 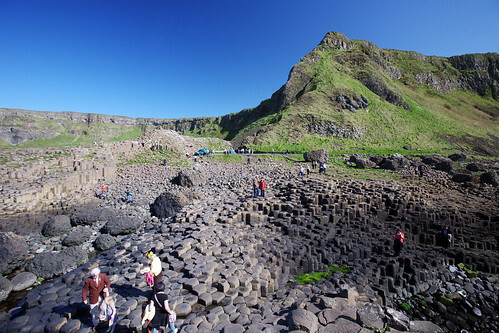 The Giant’s Causeway is the most popular tourist attraction in Northern Ireland. 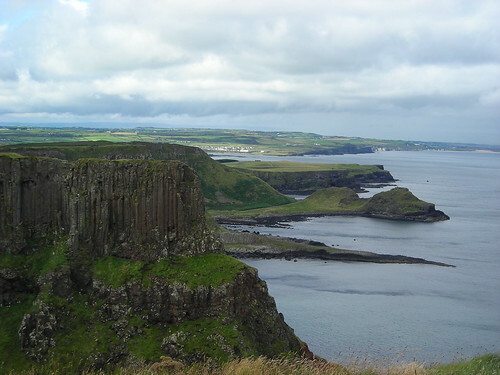 Legend has it that the Irish warrior Fionn mac Cumhaill (Finn McCool) built the causeway to walk to Scotland to fight his Scottish counterpart Benandonner. One version of the legend tells that Fionn fell asleep before he got to Scotland. When he did not arrive, the much larger Benandonner crossed the bridge looking for him. To protect Fionn, his wife Oonagh laid a blanket over him so he could pretend that he was actually their baby son. In a variation, Fionn fled after seeing Benandonner’s great bulk (= la masse, le volume), and asked his wife to disguise him as the baby. In both versions, when Benandonner saw the size of the ‘infant’, he assumed the alleged father, Fionn, must be gigantic indeed. 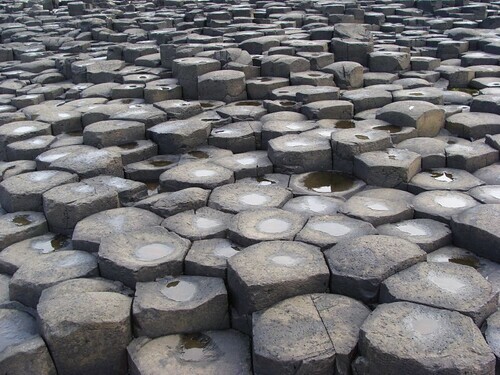 Therefore, Benandonner fled home in terror, ripping up the Causeway in case he was followed by Fionn. This entry was posted on février vendredi, 2010 at 20:01	and is filed under British Isles (The). You can follow any responses to this entry through the RSS 2.0 feed. You can leave a response, or trackback from your own site.